Identification: Sigler and Sigler (1987); Page and Burr (1991); Behnke (1992, 2002); Moyle (2002); Wydoski and Whitney (2003). 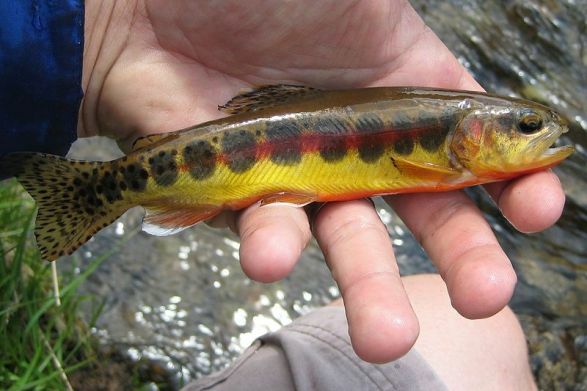 Some authors (e.g., Page and Burr 1991) consider Golden Trout within the South Fork Kern River and Little Kern River drainages to be a distinct species (O. aguabonita). Native Range: Endemic to Golden Trout Creek (tributary of the upper Kern River) and the upper middle and upper portions of the South Fork Kern River, Tulare and Kern counties, California (Page and Burr 1991; Behnke 2002). Table 1. States with nonindigenous occurrences, the earliest and latest observations in each state, and the tally and names of HUCs with observations†. Names and dates are hyperlinked to their relevant specimen records. The list of references for all nonindigenous occurrences of Oncorhynchus aguabonita are found here. Means of Introduction: Authorized introductions for sportfishing. First introduced in Arizona in 1971 (Rinne 1995) and in Idaho in 1939 (Linder 1963). According to Marcuson (1984), Col. Sherman and his brother carried 13 specimens in a coffee pot from Mulkey Creek (tributary of South Fork Kern River) to Cottonwood Creek in CA in 1876. E. H. Edwards then planted some of the Cottonwood Creek fish into Cottonwood Lakes in 1981. A "spawning station" was established at the Cottonwood Lakes in 1917 which became the source of Golden Trout eggs. Betweeen 1928 and 1938, the eggs were shipped to the National Fish Hatchery in Bozeman (but name is now the Fish Cultural Development Center). Various lakes in MT were stocked with eggs from the Cottonwood Lake station (Marcuson 1984). Status: Established populations recorded for California, Montana, Utah, and Washington. Populations in the high-elevation lakes in the Ruby Mountains, Nevada, no longer exist (Deacon and Williams 1984). Also extirpated in New Mexico. Remarks: The introduction into New Jersey (Stiles 1978) may have actually been based on stocking of "Golden Trout", a mutant form of rainbow trout raised in hatcheries (Behnke, personal communication). Bond, C.E. 1973. Keys to Oregon freshwater fishes, revised.. Oregon State University Agriculture Experimental Station Technical Bulletin 58:1-42. Brown, C.J.D. 1971. Fishes of Montana. Montana State University, Bozeman, MT. Idaho Department of Fish and Game. 2007. Fisheries management plan 2007-2012. Idaho Department of Fish and Game. Rinne, J.N. 1995. The effects of introduced fishes on native fishes: Arizona, Southwestern United States. 149-159 in D.P. Philipp, J.M. Epifanio, J.E. Marsden, J.E. Claussen, and R.J. Wolotira, Jr., eds. Protection of aquatic diversity. Proceedings of the World Fisheries Congress, Theme 3. Oxford & IBH Publishing Company, New Delhi. Wydoski, R.S., and R.R. Whitney. 2003. Inland fishes of Washington. Second edition. University of Washington Press, Seattle, WA.